This easy peasy Instant Pot French toast casserole can be made with brioche, challah, or French bread and is drizzled in a delicious cinnamon-kissed custard. To makes things even more irresistible, it’s topped with a sweet praline crumble and drizzled with vanilla icing for a cinnamon roll french toast vibe we’re head over heels obsessed with! Now that the holiday season is in full swing around here, we’ve been brunching it up on the regular with friends and family. 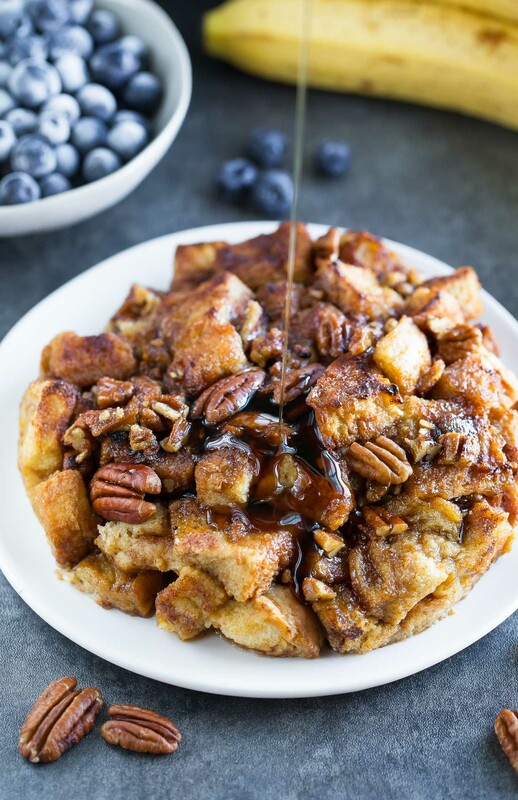 This Instant Pot french toast casserole makes a perfect (and impressive) main dish breakfast, brunch, and even brinner if you’re a breakfast food fiend like myself! Instead of dipping and cooking each slice of french toast on its own and slaving away in the kitchen when company is over, this scrumptious french toast cooks all at once, casserole-style, in a creamy custard of eggs, milk, cinnamon, and sugar. Because I’m all about the toppings, I took my french toast to the next level by adding a praline crumble topping and a sweet vanilla icing on top, giving it a total cinnamon roll vibe that I can’t get enough of! 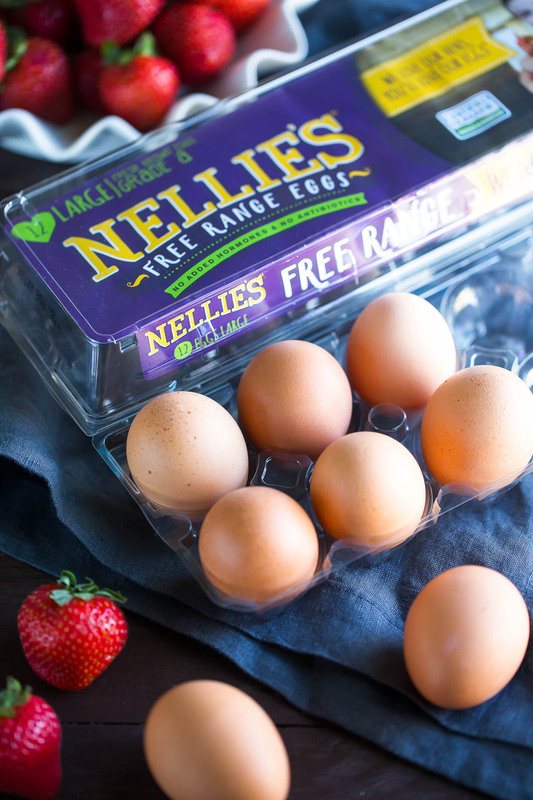 This post is sponsored by Nellie’s Free Range Eggs as part of a tasty ongoing partnership! I’m very particular when it comes to my eggs and we’ve been choosing Nellie’s for well over a year now. Their free range and Certified Humane® eggs come from independent, family owned and operated farms across the United States. Fun fact I learned about their cartons: Because they’re made from 100% recycled plastic, they have a lower carbon footprint than both styrofoam and pressed pulp (often called cardboard) cartons. They’re often made from recycled plastic bottles and able to be recycled again after using them, reducing their carbon footprint even further. Lesson of the day – recycle those egg cartons, yo! 90% of the time we recycle ours right away and the times we don’t it’s so we can upcycle them! My daughter uses the cartons to hold her finger paint and the little egg cups are perfect for holding all the different colored paints for her masterpiece. In hopes of being as helpful as possible, I made the instructions below pretty darn detailed. Don’t be intimidated! 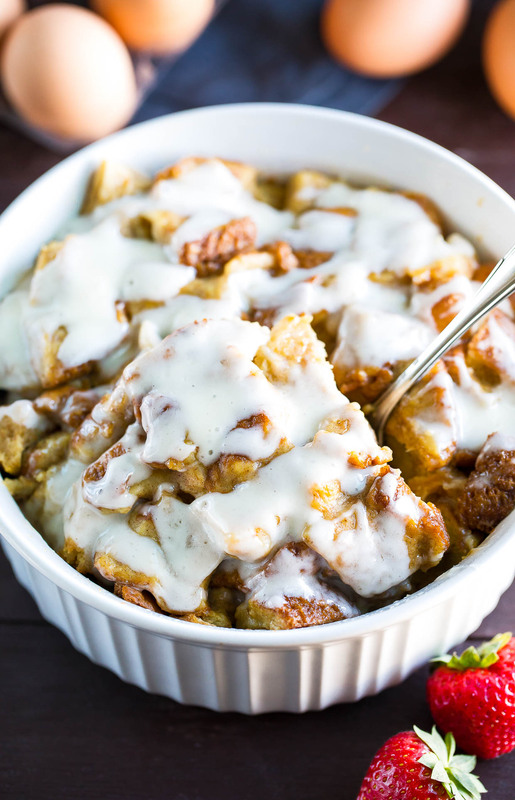 This Instant Pot French Toast Casserole is actually crazy easy to make! I’ve made it 4 times so far this holiday season for family and friends. Love. it. so. 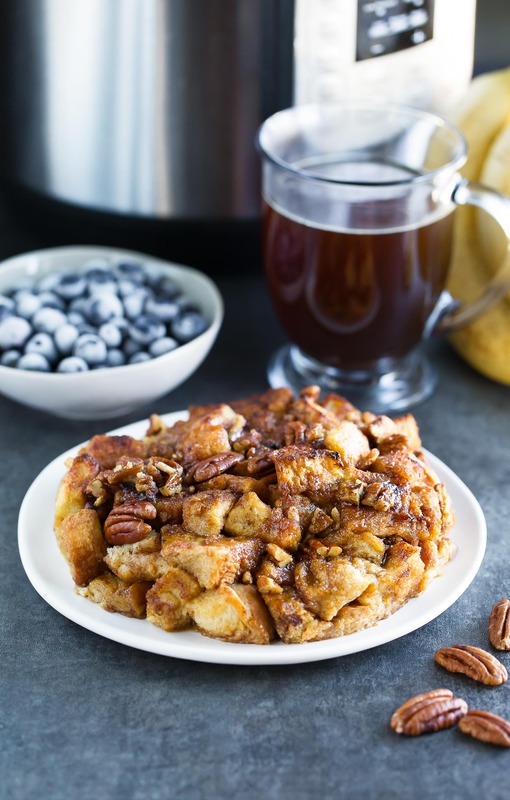 This easy peasy Instant Pot French toast casserole can be made with brioche, challah, or French bread and is drizzled in a delicious cinnamon-kissed custard. 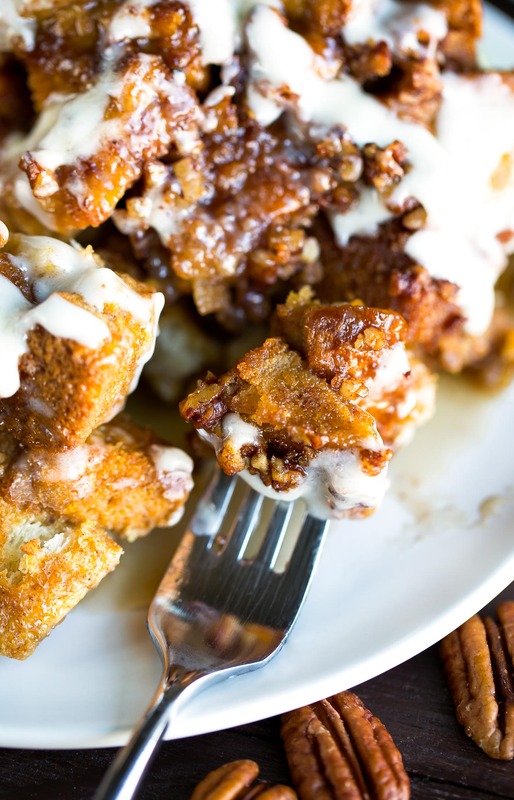 To makes things even more irresistible, it's topped with a sweet praline crumble and drizzled with vanilla icing for a cinnamon roll french toast vibe we're head over heels obsessed with! This recipe works best with stale or dried out bread - see notes below if you need to dry out fresh, fluffy bread to make this tasty french toast casserole! Prep a 1.5 quart round oven-safe baking dish. Prevent sticking by spraying with cooking spray (avocado oil is my favorite) or rub the inside of the dish with butter. Optional: Cut a circle of parchment paper to line the bottom of the dish for extra easy removal. <-- I do this and love it! Cut bread (crust included) into 1-inch cubes and add to a large bowl. Set aside. In a medium bowl, combine eggs, milk, brown sugar, vanilla, cinnamon, salt, and orange zest. Add 1/8 tsp of zest for just a hint of flavor and 1/4 tsp for an extra burst of orange flavor. Whisk until blended. Pour egg mixture over cubed bread and mix to ensure bread is evenly coated. Pour into prepared dish. To make the praline topping (optional but soooo good) combine the ingredients and mix well using your hands until texture is almost sandy and paste-like. Sprinkle on top of the casserole. Cover your baking dish with foil (to prevent condensation while cooking) and place the dish on top of a handled trivet. My Instant Pot came with one but if you only have a regular trivet you can make your own handle out of folded sheets aluminum foil! Pour 1 cup of water into the inner pot of the pressure cooker and lower your baking dish into the pot on the trivet. Lock the lid and set to 28 minutes high pressure. Ensure sure valve is in the sealed position. While the casserole cooks, make your icing. Using a hand mixer or a whisk and some muscle power, blend together softened cream cheese and butter until creamy. Mix in powdered sugar and vanilla and season with a teeny pinch of salt. Blend well and feel free to add an extra 1/4 tsp of vanilla if you'd like extra flavor! For a crisp topping, feel free to place casserole in the oven and broil on HIGH for 3-4 minutes, watching very closely to prevent over-toasting or burning. This is totally optional but it has an awesome texture if you can spare a few extra minutes! Top casserole with icing and dive in with fresh fruit and maple syrup for drizzling. French toast casserole is best when made with drier, stale bread. You can leave the bread out on the counter the night before making this dish or cut bread into 1-inch cubes and bake spaced on two baking sheets at 325 degrees F for 20-25 minutes. Easy peasy! The orange zest is optional but adds a little extra flavor to the casserole that I just can't get enough of! It almost ends up tasting like orange cinnamon rolls if you've ever had them! Looking for a small-batch version of this recipe? You can totally cut the recipe in half if desired! The halved recipe will fit perfectly into a 7-inch cake pan, push pan, or springform pan. If using a pan with a removable bottom, be sure to tightly wrap the bottom of the pan with foil to prevent any liquid from sneaking out. You will also want to change the cook time from 28 minutes to 15 minutes high pressure with a quick release at the end. Easy peasy! 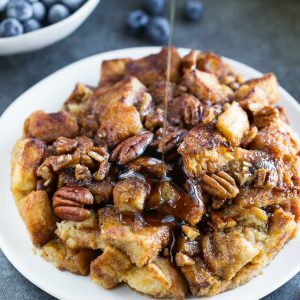 If you get a chance to try this cinnamon-kissed Instant Pot French Toast Casserole, let me know! Leave some love in the comment form below or tag your photos with @peasandcrayons on Instagram so I can happy dance over your creation! I can’t wait to see what you whip up! Looking for more tasty egg-centric eats? So far we’ve used our Nellie’s Free Range Certified Humane® eggs to whip up an Instant Pot Frittata Breakfast Casserole, some crazy healthy vegetarian Breakfast Salads, and some delicious make-ahead Breakfast Burritos. SO GOOD! Find out with our free weekly recipe newsletter! Can you just put it in the crock and not a baking dish? Just new to my express cooker. Hey Heather! It won’t unfortunately. The Instant Pot needs a cup of pure liquid to cook otherwise the food sticks to the bottom and burns, which activates the auto-shutoff feature. This is so awesome. The Insta pot makes it so easy. very good and more importantly very easy! And no frying pan to clean up! I did have an issue with the quantities – since I was only making it for two, I halved the egg mixture recipe but when I poured it over the bread, I had quite a bit of liquid at the bottom that the bread had not soaked up. I ended up using the full amount of bread and 1/2 the egg mixture and it turned out beautifully. Hi Jenn, Do you think I could use parchment paper in place of the aluminum foil? I would just have to wrap it around the pan so that it would stay and lower it into the pot? Hey Claudine! So it’s totally safe to do so (love me some parchment paper) and you can secure it over the pan with a super stretchy rubber band if you have one. I always save the rubber bands off my produce (haha they come in handy!) for random uses like that. You just want to make sure it’s secured and you should be good to go! If for some reason the foil I used was insulating heat and contributing to the cook time then simply check the center for doneness and you can always add extra time if needed. Hope this helps! Loved the detailed directions and this casserole was delicious! 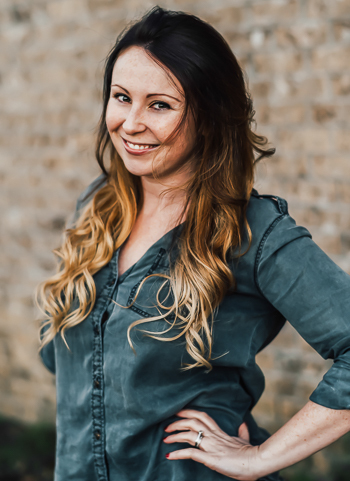 So so happy you enjoyed it, Jennifer – Thanks! Oh no! Can I help troubleshoot? We’ve made this one a bunch of times and during testing I noticed that 2 main things could leave it eggy in the middle. First would be to not use dried out or stale bread (soft bread likes to soak up the custard and turn mushy right away which is hard to recover from) and the second is not enough time in the IP which could be due to a different size IP or swaps/changes. What size instant pot did you use and were any changes made to the recipe? Little differences could just mean that you need to set a higher cook time and if it wasn’t the soft bread issue, it can still be cooked for longer either in the IP or just in the oven this time around while we get to the root of it. Can this be baked in an oven? If so, what temp and how long? Thanks! Yes totally! The casserole can be baked in the oven, at 350 degrees for approx. 35 minutes (it varies oven to oven) or until the middle is cooked through and the top is golden. I did a test round with this method for a friendsgiving brunch! Hi, how are leftovers? I am making this for my son’s xmas party tomorrow morning. I want to make it tonight but i’m afraid it won’t be as good. I was thinking of getting all of the ingredients together and then in the morning pour the praline over the bread and cook it right before I go to the school. The icing i’ll make tonight as well. What’s your recommendation? Do you think i’ll be ok just making it tonight and warming it up tomorrow? This is easy, yummy and perfect for a special holiday or a girls brunch!!! Sign me up for the next brunch! This delicious recipe has all the elements of great French toast combined with the added sweet, buttery crunch of the praline topping. Definitely filing this one away for when I want to impress guests with an amazing brunch! Consider me your guide to all things veggie! It'll be fun, painless, and pretty darn delicious as I teach you to plan your meals around fresh, seasonal produce with a little help from healthy freezer and pantry staples. Baked Seafood Dip with Crab, Shrimp, and Veggies!